MiShel Designs: My Bead Table Blog Hop - Revealed!! 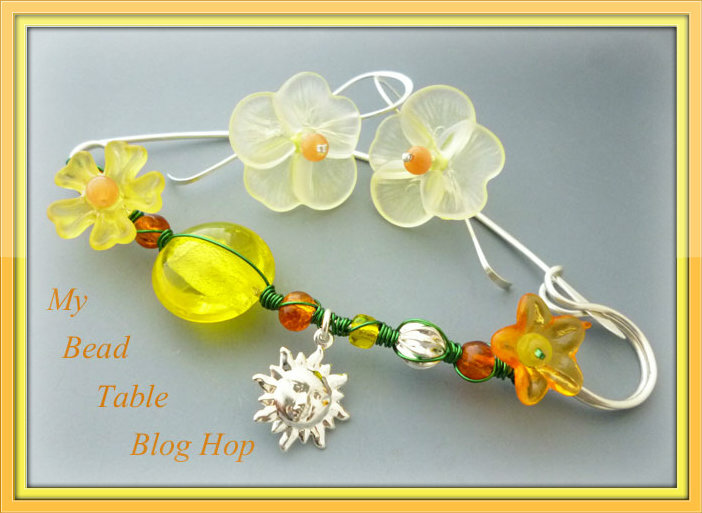 My Bead Table Blog Hop - Revealed!! had so graciously sent me for the Bead Table Blog Hop she was hosting? And how I told you what a challenge it would be for me since so many of the beads she sent were ones I didn't normally design with? Well today's the day you get to see what I, along with the other participants, created with our stash of goodies! 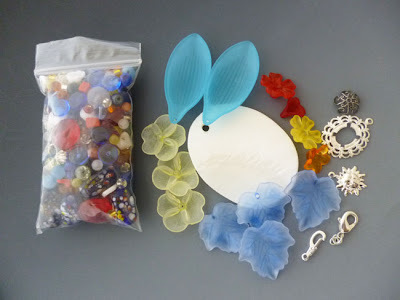 Everyone was sent something different from Lisa's bead table and we were instructed to create things using her 'bead table stash' along with little goodies from our own bead tables. We were instructed not to purchase anything (if possible) to go along with our beads we were sent and to be as creative as possible. First up, there's the Red, White And Blue beads which completely captured my attention - I love Red, White and Blue (Go Wildcats!!) Of course this will get worn over the 4th of July, but also during all the U of A games!! I know,...I live in Phoenix not Tucson any more but, I'm a Wildcat fan, what can I say!?! I took the mother-of pearl pendant that was in the bunch that Lisa sent and mixed in the blue glass rectangle beads (that remind me of Italy, by the way!) 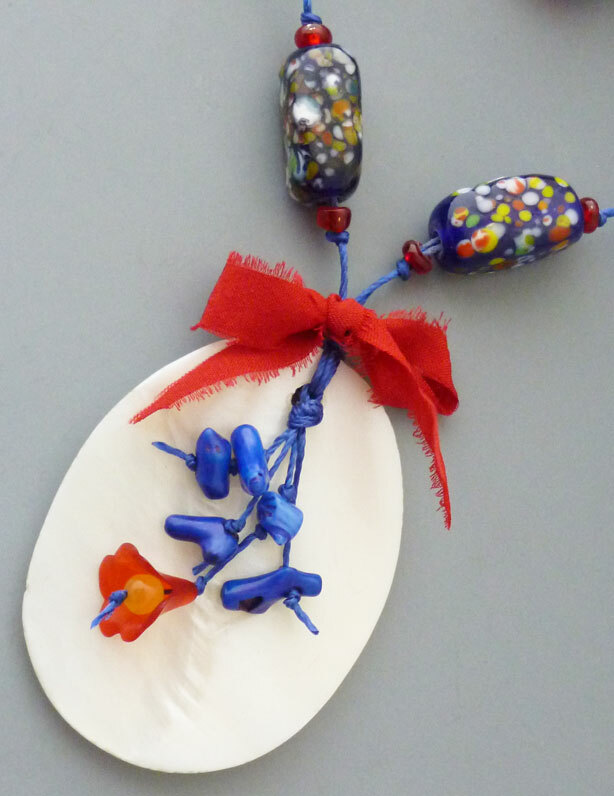 and the red disks,...and a few little seed beads and then used one of the lucite flowers and the 'blue coral' beads in the little dangles and another lucite flower as the clasp / connector. 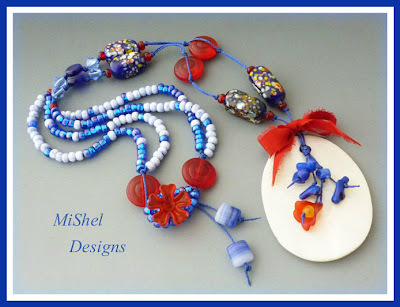 From my own bead table I used the blue seed beads in navy and a mixed blue/white color and I knotted everything on some S-Lon cording. (the bead shop where I shop doesn't carry C-lon and S-lon and C-lon are basically the same material,...mostly the same colors/sizes, too - just FYI). Oh, and I tied on a little bow of recycled Sari Silk that I got from Hampton Artistic Yarns over on Etsy. And then there were all the lucite flowers,....oh boy, what to do with these - this was the challenge! I don't use much lucite, acrylic or plastics in my work and even less flowers,.....so these were super hard to get in the 'zone' with. I love how all my fellow beady-peeps I follow can make these sweet flowers look so wonderful and appealing in their designs - me,....not so much. They look forced and way weird when I use them. That's how I feel, anyway. However, these earrings happened quite easily,....and they make me want to have spring all over again, even though I love Autumn! And then, I'd read a post (so wish I could remember where,...it was from a department store,...I think?? oh well, anyway) and the post had this link to a video showing how to creatively wear brooches,...Was is Nieman Marcus? Oh poo!! It wasn't, but for the life of me I didn't save it and cannot find it - anyway - back to what I created. 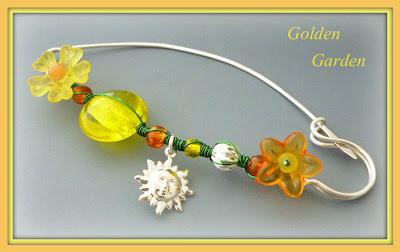 I wanted to create something I don't make very often but really enjoy designing, so I made a fibula/brooch and used the yellow and orange beads and flowers Lisa sent along with 16g sterling silver wire and then wrapped the beads with some pretty green craft wire to make it seem more like a garden. So, last, I turned my attention back to the blue beads,....it's a safe bet,..me and blue! I think these will be fun with some jeans, a white-T and of course,....a blue jean jacket! I still have tons of beads left over from what Lisa sent me, but I used as many as I could for now. 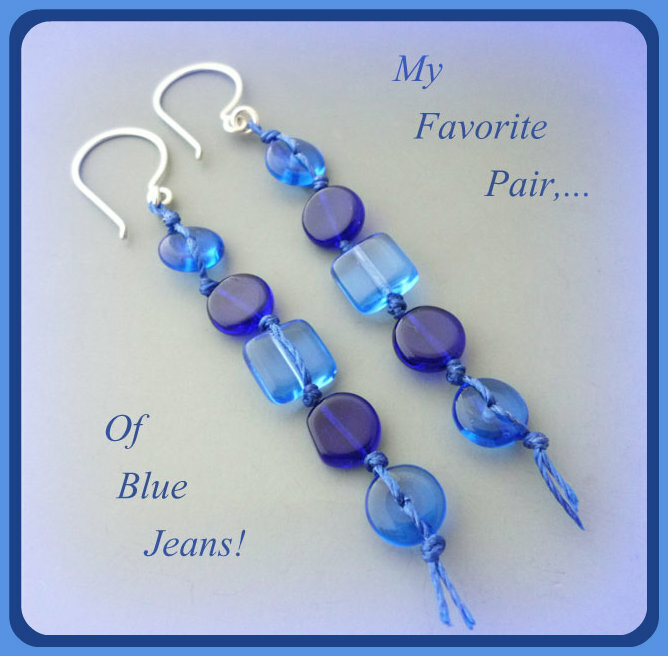 I do have plans for those blue Lucite pods,...earrings of course! When I get those created I'll post them here on the blog for you to see. I want to thank Lisa for sponsoring and hosting such an enjoyable challenge. It really stretched my creativity and was a ton of fun!! Please hop on over to each one of the participant's blogs below and check out all the lovely pieces they've created - I know you will be impressed!! Peace, Love and Beads from My Bead Table (and Lisa's)! Oh Shel you killed this! You design are stunning as always! I love that first necklace! 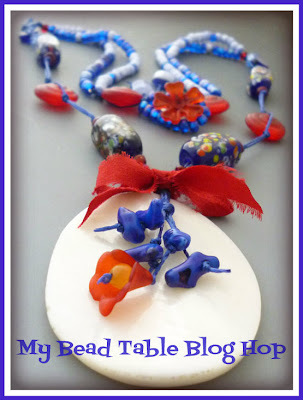 I still have those large blue, white and red fleck beads on my table. I've been kicking them around in a couple of patterns but haven't used them yet. Your necklace is so inspired with them! And I love that you did those sweet little earrings! I was stumped by the flowers. but I LOVE how you did those. But then that brooch. Did you make the wire clasp yourself? Oh man I want to find that pattern. That is awesome! You know, I'm not really a 'flowery' kinda gal either, but I think those flower earrings are actually my favorite! I love what you did with the necklace, all the details are amazing. Emma Todd was just asking yesterday if brooches were coming back. I particularly love the fibula pins, so I was thrilled to see what you did with this one. Very cool! What a treat to read your blog post this morning, so filled with wonderful flowery things to wear. The little details you've put into each piece make these very special. I'm especially in love with the fibula with the tiny green tendrils. 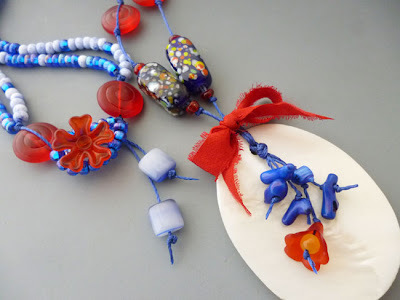 I am always stumped when it comes to using red, white, and blue together, but your necklace is awesome and so very pretty. The flower earrings and the fibula pin are beautiful. I agree the blue earrings will go wonderful with the white T-shirt and jeans. I *love* everything you did. The necklace is just inspired and I love all the different textures you used. The pin and earrings are beautiful as well. I'm with you on everything, too; I would have been SO out of my element with the things you were sent! Shel - your designs turned out awesome, as always! That brooch really captured my attention - LOVE it. Glad you liked the red white and blue. Wonderful job. Thanks for being in the hop! Two divine sets. Love your sense of adventure with that petal. I hadn't a clue what to do with mine! The funky airy look works well. Ooohhh lalalalala!!!!!! Yeah, I know that's not even a word or a phrase, but this is gorgeous!!! LOVE the red ncklace! What is C-Lon or S-Lon? Am going to have to look it up. Loved the pin too! And the yellow earrings. Awesome! I just love both pair of earrings but especially the blue ones. They just look like so much fun to wear. Simply beautiful is all I can say about your inspired and inspiring designs. I must admit, those flower earrings are my favorite, so elegant and so perfect! Oh Shel - you are amazing! 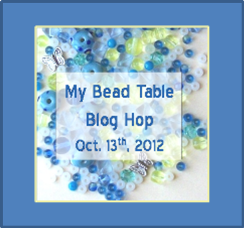 I was so excited to see what you made with your beads, and you truly floored me! All of your designs are fabulous, but if I had to pick a favorite, I'd have to go with the red, white & blue one. We're going to have to get together one of these days so you can teach me how to knot like a pro! All very cool Shel! I love what you did with the mother of pearl pendant. My favorites are probably the blue jean earrings because I can tell they would be so much fun to wear, and the lucite flowers turned out really sweet as well! Your pieces are lovely, and your photography is amazing! I love the blue coral, but those earrings are my favorite. You really made the most out of this challenge. Well done. You really rocked this challenge and created some really wonderful pieces, I don't think you flowers look forced at all. As usual you have amazed me. From bright and fun to soft and sweet these are all amazing! Finest creations, exquisite designs. Greetings. Your designs are amazing!! Your Wildcat necklace is so fun - all of the other fans will be drooling over it! 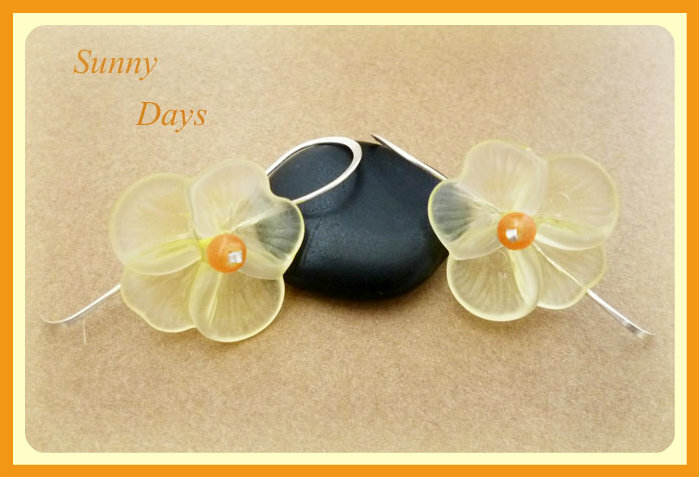 Love both earrings and your brooch - great design and idea - love the wire wrapping! Great pieces! !